The new Francis W. Parker School library will have bookshelves on coasters, allowing them to be moved to create open space. LINCOLN PARK — The students at Francis W. Parker School are ready for their new library — and how. Students "oohed" and "ahhed" at renderings of the library during an assembly last week as the library prepared to close for construction to begin next month. The library begins a $5 million renovation that's been three years in the making. It's expected to "integrate the use of technology into curriculum and vice versa," according to the school's tech specialist Sarah Beebe, and offer maximum flexibility and adaptability for future technological advances. 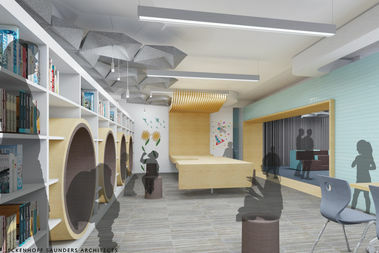 As conceived by Trung Le of Wonder, By Design, it will include circular reading nooks students can crawl into with a book, a Lego table, bookshelves on coasters allowing them to be moved to create open space and noise-reduction panels in the ceiling. The new Parker library will have reading nooks that students can crawl into and a Lego table. This is not an old-school library, and rules have been relaxed to allow conversation. Rooms and other spaces can be closed off lend themselves to instruction and small meetings. It will have "living green walls," with ivy at the entrance, and an open-air porch known as "the Cloud," overlooking Parker's turf field. "The community really stepped up to make all this happen," with a fundraising effort that left operational funds untouched, Beebe said. She added that it was critical for the school to stay abreast of technological advances, and pointed to how students were already using devices like 3-D printers in the library to make projects such as a Roman colosseum constructed of paper. Parker, at 330 W. Webster Ave., is considered one of the city's leading private schools with 14 grades running through high school and a current enrollment of 934 students. 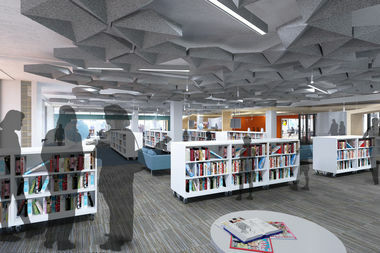 The new library is expected to be ready for the start of the next school year.